Fifteen Wellesley students joined the 8,000 or so attendees at the Grace Hopper Celebration of Women in Computing last week in Phoenix, Ariz. The conference, which draws participants from academia, industry, and government organizations, is produced by the Anita Borg Institute, which calls it "the world's largest gathering of women technologists." This year's 20th anniversary event, presented in partnership with the Association for Computing Machinery (ACM), had the theme “Everywhere.Everyone.” That's in keeping with The Anita Borg Institute’s vision of “a future where the people who imagine and build technology mirror the people and societies they build it for.” As the conference program notes, "Computer technology is everywhere in our lives. Everyone is involved somehow in computer technology design, development and deployment. Everyone can connect everywhere." Professor of Computer Science Ellen Hildreth attended the conference with Wellesley students Natalie Anderson '15, Cathy Bai '15, Madeleine Barowsky '18, Katherine LeVine '15, Veronica Lin '15, Shirley Lu '15, Tali Marcus '15, Michelle Olynyk '16, Claire Schlenker '16, Michelle Sit '15, Cali Stenson '17, Sheridan Sunier '15, Yi Tong '15, Sarah Xu '15, and Hanlu Ye '15. Some students received scholarships from sources like the Anita Borg Institute, Google, Apple, and the conference itself, and funds for student travel to Grace Hopper also came from generous donations from Wellesley alumnae. A number of Wellesley alums also attended the conference. Hildreth says, "It was a great opportunity for our students to meet, and be inspired by, successful women in all areas of technology; learn about research and career opportunities across many areas of computer science; and attend workshops on career development, new technologies, and so on." 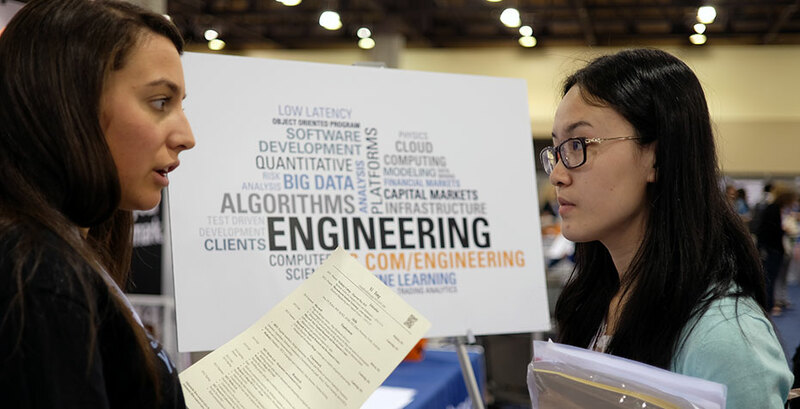 At the conference's career fair, there were more than 300 booths with representatives from as many companies; academic institutions; and nonprofit, government, and media organizations. Several Wellesley students took advantage of interview opportunities offered by many of the organizations. Wellesley is a member of Liberal Arts Colleges Association for Faculty Inclusion (LACAFI), whose mission is to increase the diversity of science faculty at liberal arts colleges through recruiting efforts at international conferences. The organization was a collective Silver Sponsor at Grace Hopper, and Hildreth represented Wellesley at the LACAFI booth. Sheridan Sunier looks back on the Grace Hopper experience as "incredibly rewarding and inspiring." She says, "The tech industry is male dominated—more so than many other industries out there—and to be surrounded by women who are doing amazing things in the field I want to enter was awesome." As Tali Marcus put it in a tweet: "#ghc14 is like the @Wellesley CS department on steroids." Also last week, Clare Booth Luce Assistant Professor of Computer Science Orit Shaer traveled with five students from Wellesley's Human Computer Interface Lab to the 27th ACM User Interface Software & Technology Symposium in Honolulu, Hawaii.